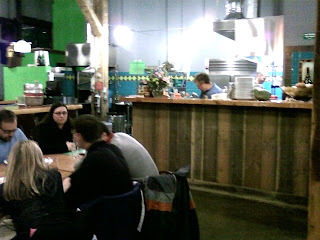 Back in December when I finally phoned in a review of Hair of the Dog's tasting room on Water Avenue, I was kind of dismissive about the food, saying that it was generally a little overpriced, and that it looked like there was a lot more bustle in the kitchen than was called for by the menu. Granted, it was just an early impression offered with the caveat that I hadn't done a lot of dining there. Well, I still haven't dined there much, but last Saturday I was in there for a double date, and we were all extremely pleased with the food. Carla and I were not all that hungry, so we split two small items from the menu: the $6 slab of beef brisket, and a $4 plate of carmelized brussels sprouts. Already from previous visits I had decided that the brisket was the best deal on the menu, and Saturday it was served with a simple green salad on the side, which makes it an even better deal. So what, cheapskate? : the price doesn't matter if the food is bad. Saturday the food was a home run -- deliciously moist and flavorful brisket, an interesting citrusy dressing on the lettuce, and the sprouts cooked exactly the right amount. Our friends Joe and Lisa were also quite happy with their respective orders of macaroni and pork spareribs. So, I take back my earlier grousing about the menu and the prices. Unfortunately we missed the bourbon-barrel version of Fred from the Wood that had been on tap earlier last week. But I finally got to try the Adam version of HotD's Little Dog small beer. It was smashing. They bill it as "smoky", and while there's a little of that Adam smokiness, it doesn't seem to me to be the dominant flavor. I get more of a plummy, dark fruit flavor, though since this is a very light 3.5% brew, it's not plummy the way you think of darker dessert beers. It reminded me of Anchor Bock, but with more flavor and less alcohol. I've really liked all the Little Dogs I've tried -- including the Fred version which was also on tap Saturday -- but the Adam variant is really something not to be missed. It's also fun to taste it alongside the big dog Adam. Now I've got to figure out how to get by there more often Wednesday through Saturday after 2 PM but before 8 PM. Oh, and sorry about the headline, I couldn't help myself. I have been way remiss on getting to HotD. Adam Little Dog is just the provocation I need. I think there are some excellent items on HotD's food menu. Don't miss the cheesecake. The quality of the ingredients is evident and I think the prices are very reasonable. They're also pretty adventurous with specials, like pig's heart. As a counterpoint, I've been disappointed with the brewer's platter (meat/cheese plate) a couple times and probably won't be getting that again, as much as I'm drawn to it. To me, a meatloaf-sized slab of headcheese is just too over-the-top and there's not enough variety in the meats/cheeses to justify the $16 price tag.